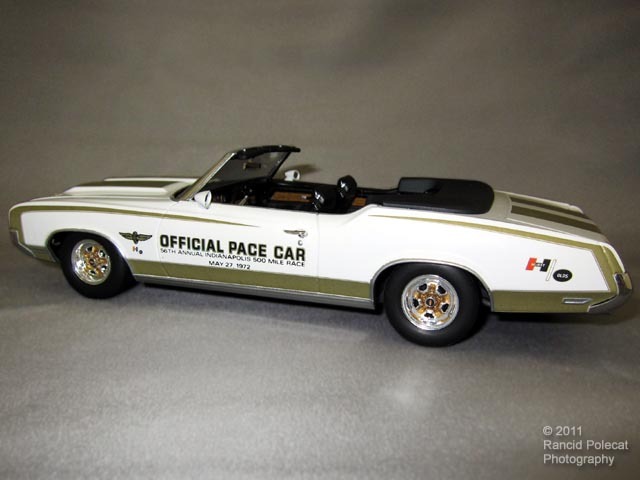 Starting with a Revell 1972 Hurst Olds Cutlass 442 Convertible kit, Gary built this one straight out of the box. After coating the body with a bright White Rustoleum paint job, Gary layered on the the kit Hurts Olds stripe and logo decals. He followed that with a set of Fred Cady Official Pace Car decals commemorating the 1972 running of the Indianapolis 500 Mile Race. A bit of paint detailing on the color-keyed Oldsmobile 14" x 7" wheels sets off the exterior.